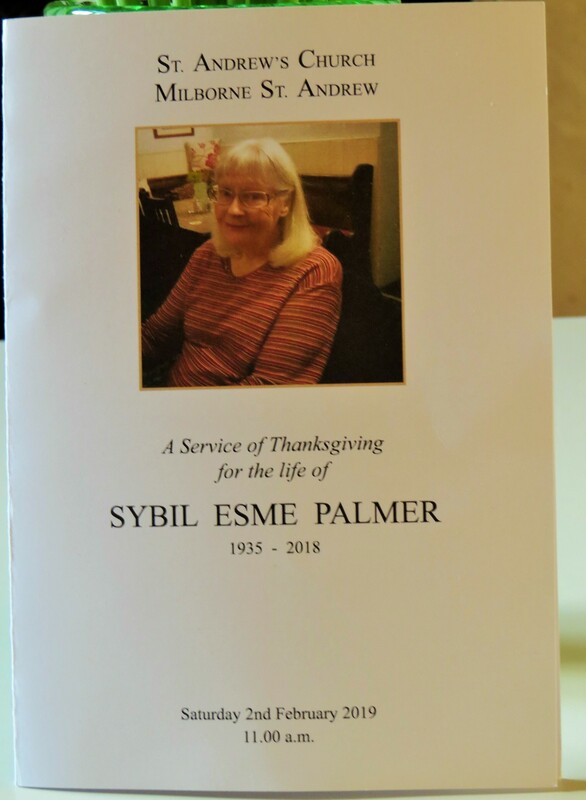 Dear Readers, on Saturday last week friends and family gathered to say goodbye to my Mum, Sybil Esme Palmer. Many people had battled through the snow to get there, following a blizzard the previous night, and the inside of the church was so cold that we could see our breath. 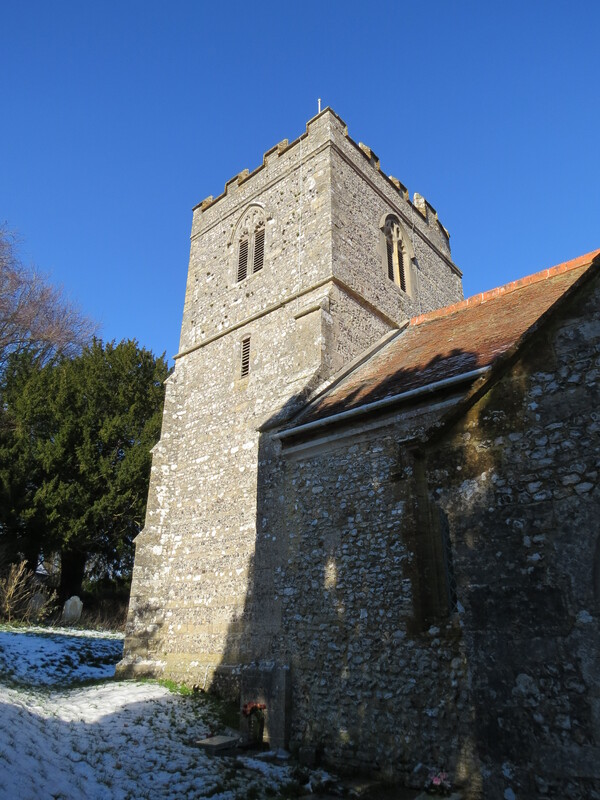 But the church was full, and the singing was hearty. We sang ‘All Things Bright and Beautiful’ and ‘Jerusalem’ and ‘Immortal, Invisible’, and my brother read the eulogy with a composure that was all the more impressive because I knew how devastated he had been by Mum’s death. We had been very concerned about whether or not to bring Dad to the service. For weeks he hadn’t mentioned Mum, and seemed to have forgotten all about her, so we were worried that suddenly plunging him back into the reality of the situation – that his wife of 61 years had died- would distress him greatly when he was already so confused and frail. But then, a few days before the service, he began to talk about Mum again, and so we took the decision that he needed to be with us all. One of his carers from the nursing home came with us and Dad held her hand all through the service. I am so glad that he was able to come: it would have felt very incomplete without him. 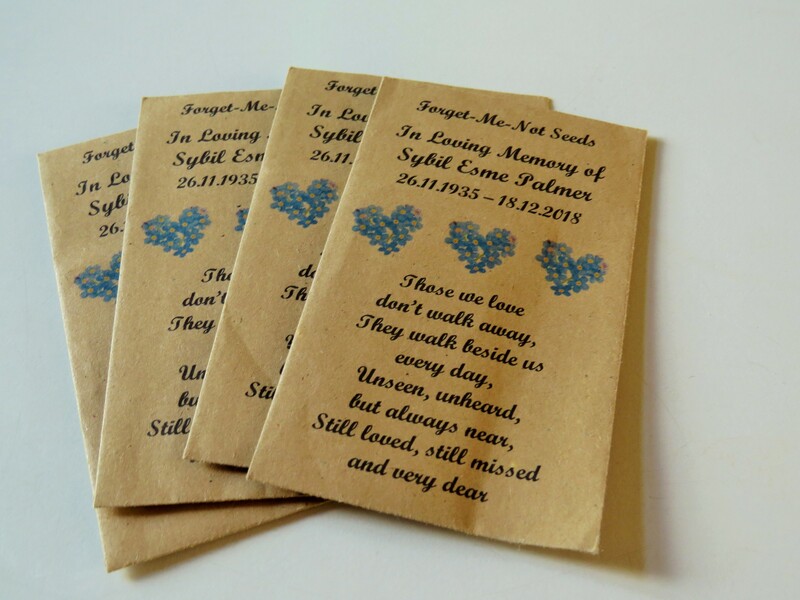 And I think he rather enjoyed the reception afterwards, which was beautifully arranged by my brother’s partner, and which had some very thoughtful touches, like the packets of forget-me-not seeds that everyone could take home with them. Dad recognised his two sisters, and many people from the village. Everyone took the time to talk to him, in spite of the fact that what he was saying didn’t always make sense. Once this village takes you to their heart, you’re theirs for life. There was such a feeling of palpable love in the room, both for Mum and for Dad, that it seemed to lift a shadow from my heart. To have inspired such a spirit in such a diverse mix of people is a true memorial to the character of the people who are no longer with us. And also, I might be biased but I cannot believe how handsome my Dad is. He seems to be being scoured away by dementia, but he reminds me now of an ageing film star. No wonder the ladies in the nursing home have a soft spot for him. And then, of course, everyone goes home and here I am, with my memories and my sadness. I feel as if I have slowed right down to walking pace. I am finding great solace in cooking at the moment, and am baking bread as if the shops will soon run out. And then I was sitting at my desk writing, and happened to look up, to see this little chap. My Mum was such a creator, of toys and clothes and food and paintings. I mentioned to her that someone I knew was pregnant, and Noddy appeared a month later. He looks as defiant as my Mum often was, hands on hips and refusing to take ‘no’ for an answer. I love the laces on his shoes, his hair, his little belt and scarf and the bell on his hat. I must have ‘forgotten’ to pass him on, because there he was on the shelf, and I had no idea that he was there. When I took him down and cradled him he brought back everything that was fine about Mum, her generosity, her skill, her enormous heart. I don’t think I’d realised how much I missed her until that moment. Everyone that I saw at the Memorial had received something handmade from Mum. 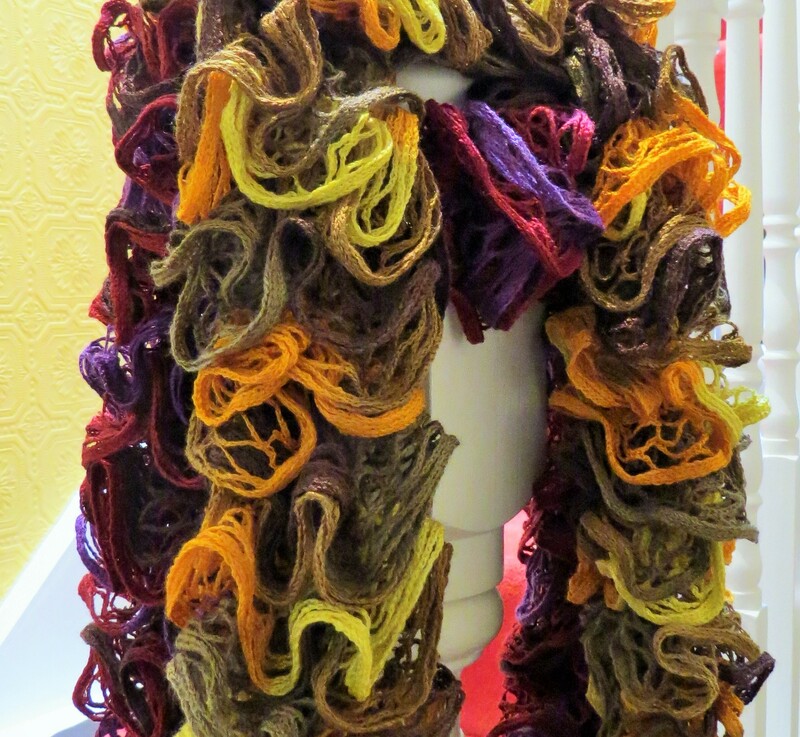 Towards the end of her life she became very fond of making scarves, and giving them to anyone in the village who stood still for long enough. I remembered that I had gotten one from her, and went into my wardrobe to look. She’d made me four. And then, I remembered The Bag. 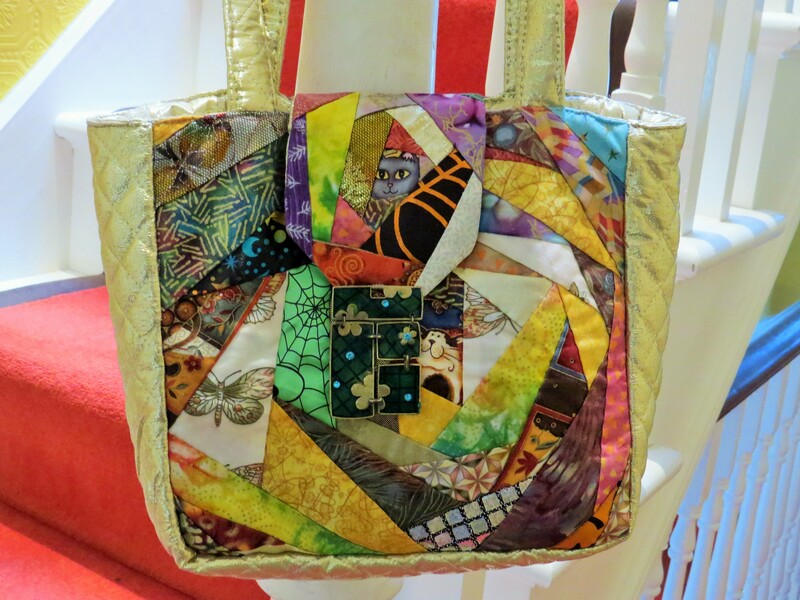 This was from an earlier period, when Mum was into patchwork quilting, and I think that it’s astonishing. I use it on special occasions, and have to wear something plain because it’s always the star of the show. Mum pieced together all those tiny pieces of fabric just before she started to get numbness in her fingers, and became unable to do such fine work. Life took so many things away from my mother, but she kept turning to the next thing, determined to create until the very last months of her life. Ah Mum. What a lousy time of it she had over those past few years, coming down with one illness after another, gradually losing her mobility and, I fear, showing the first signs of dementia right towards the end. But she took such joy in things. A few weeks before she died, I bought Mum and Dad a box of Hotel Chocolat chocolates, and although Mum was barely eating at that point she managed three, each one cut into quarters. Later, she had a liking for toffee yoghurt, and the carers rushed to make sure there were enough in stock. Nothing that life threw at her could ever completely dent her spirit, and she found something to be glad about every single day. Her heart was full of love until the day she died, and for all I know she loves us still, as we do her. RIP Mum. This poem was read out at the service. I hope you’ve found your Inn at last. This entry was posted in Bugwoman on Location on February 9, 2019 by Bug Woman. So glad your mum’s memorial went well. It’s so lovely that you have all those things to remind you of her, she was obviously a very talented lady, that bag is amazing! 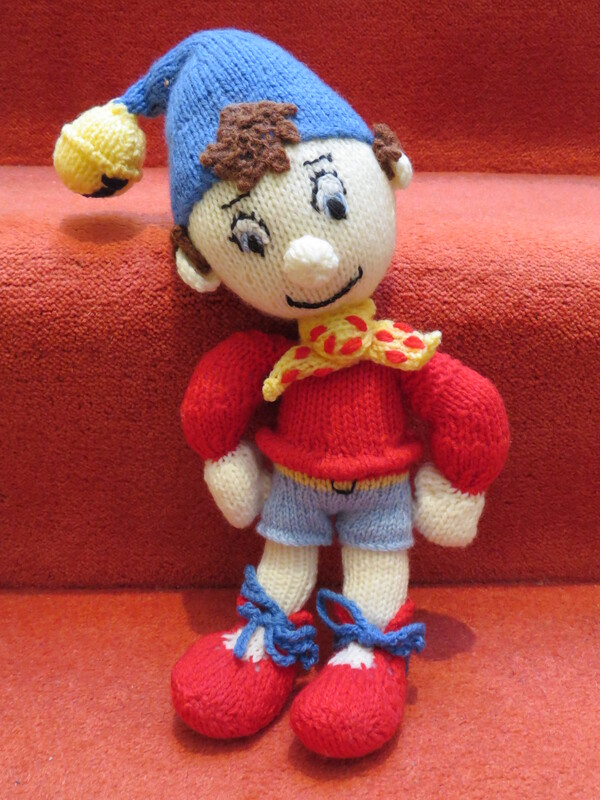 We have such a soft spot for Noddy, so much so that is what i call my Fiat 500. Our mother was a seamstress by trade and it will be 15 years on Tuesday we lost her, but we find she’s very much still with us. We can see what you mean about your dad, our father was one for charming the ladies. What a lovely touch the Forget-me-Not seeds were too. Keep enjoying nature and writing your blogs, we very much look forward to them. Thank you Fran and Bobby. Dad has recently decided that he is 27 and running his own haulage business, which is something of a surprise to us. He rings my brother up at 3 a.m. to tell him that the lorries need to be loaded :-). But he did have a lovely time, even if he’s forgotten all about it. At least he’s able to enjoy things in the moment, and there’s maybe a lesson there for all of us…. A lovely tribute to your mum and a sweet goodbye. Thank you and keep writing. All the best to you too Pen, I know you’ve been through it recently too…. A very touching memorial about your Mum, that must have taken courage to write. What a beautiful post for your mother. Thank you for sharing your heart. 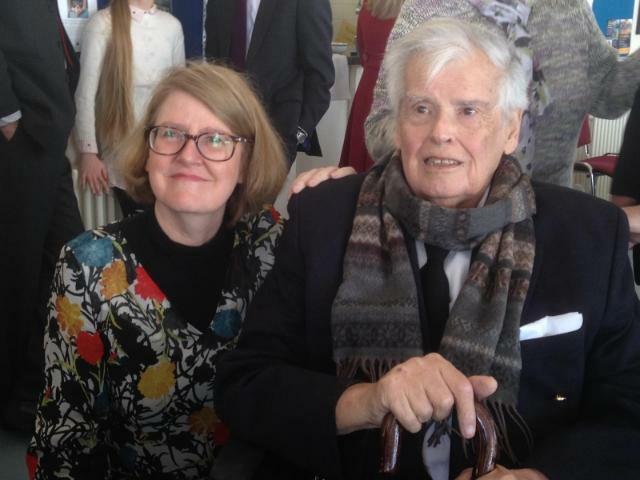 Your mum sounds as if she was a remarkable woman – So glad the memorial went well and that your dad was able to go too. Lovely touch with the Forget-me-not seeds. My mum has settled into her care home well which is good but I have noticed a marked deterioration in the 3 months she has been there. Like with your dad, her dementia has ramped up to a whole new level. Can’t be helped though and as with you, there was no other choice really. It’s tough isn’t it – Glad your dad managed to attend the service though. Important for all of you. A beautiful and moving poem to end with – I’m glad that the service went well and that your dad was able to go. You have some beautiful things to remember your mother by. Thank you, Andrea…how is Winston doing? I see he’s still having his hydrotherapy…. He’s doing well thanks Vivienne. He’s now gone from having it every week to once a month as he’s much stronger, and we’re able to go for longer walks again. It’s lovely that so many friends and family came together to remember your mum: the power of their love will help you in the coming weeks. My dad’s service was so uplifting, and the lunch party afterwards so full of love, that when I think back to that day, I feel almost joyful. For Mum, it seemed to wipe away all the anguish of watching Dad suffer during the last months of his life. I’m so glad your dad was with you for your mum’s service. What a wonderful photo of you both! Thanks, Liz. These collective acts of witness and remembering are so important. It reminded me that there was so much more to Mum than the suffering of her last few weeks and months, which was very liberating. I felt almost as if I’d been holding my breath, and could finally let it out…. What a tender tribute. It’s wonderful you have her many artistic creations to treasure. The poem is perfect; I had never read it before. I wish you lots of peace and sweet memories. Thank you Cheryl….I do feel more peaceful. The grief doesn’t go away, but the anguish eases…. Thank you, Laurin, so much appreciated! That bag is a glorious memento of your Mum and the scarves just add to it. You’ll continue to treasure them. He is a favourite, Toni! If Mum is looking down from Heaven and seeing all the cuddles he gets, she’ll have a rolling pin ready to wallop him with when he gets ‘upstairs’….. It sounds like a wonderful service for your mum. I’m so glad all went well and yes, your dad is very handsome! You take after him. 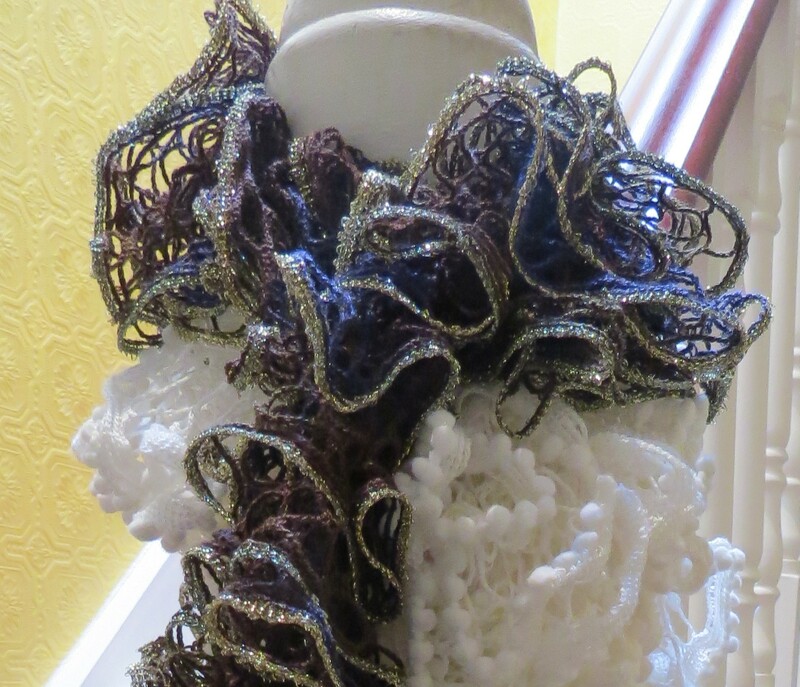 Your mum was a very gifted lady; the scarves are beautiful and what a gorgeous bag that is. The sense of loss never goes away; the grief comes in waves and hits you often when you least expect it but the one thing I can assure is that it gets better. This is ineffably moving and brought me to tears. You had a great mother. I hope that your father is holding up; I hope that you are holding up. You will undoubtedly think of her every day of the rest of your life. Thank you for such a beautifully written commentary and the magnificent photographs. Oh, thank you, Gubbinal….she was a great Mum. And I have Dad to thank for my love of nature. I have been very, very lucky.